Our luxurious soap makes the perfect unique gift. We have a variety of gift options on this page, and remember to also check out our personalised soap gift page. 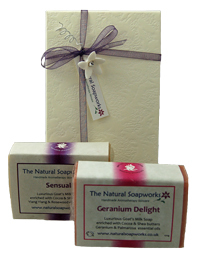 This is a lovely gift idea for someone who enjoys using natural soaps. We'll be happy to despatch any of these items direct to a gift recipient's address, and will also include a special message (free of charge) so they'll know who sent them their gift. 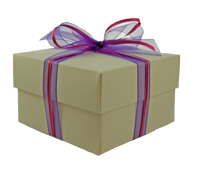 If you'd like a particular variety of soaps to be included in your gift set, simply tell us which ones you'd prefer. Special requests like this should be made in the notes box at the checkout or send us an email with further details to enquiries@naturalsoapworks.co.uk.